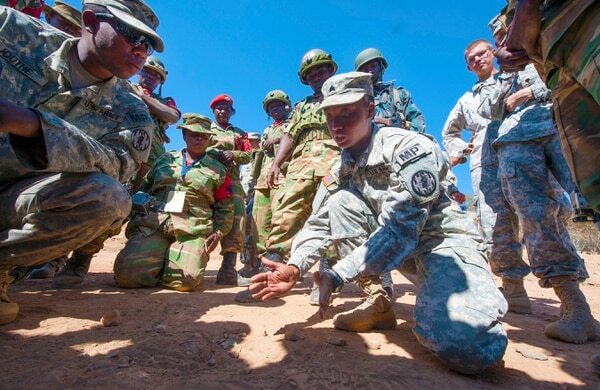 The Army has built critical partnerships across the African continent, but there is still work to be done especially as armies across the region continue to fight threats such as Boko Haram and al-Shabaab, the outgoing commander of U.S. Army Africa told Army Times. "Africa matters," said Maj. Gen. Darryl Williams. "We've learned a lot, and we continue to learn. The enemy knows no boundaries, so it's important to have good partners on the African continent." It's more important than ever to continue working with partners, not just in Africa but around the world, Williams said. "One of the things that strikes me is the interconnectedness of these fights, these threats that we face, whether they be in Africa or Europe," he said. "All of the combatant commands, and certainly the [Army service component commands], we're working the same mission sets. It's important now more than ever that we continue to work together and communicate." 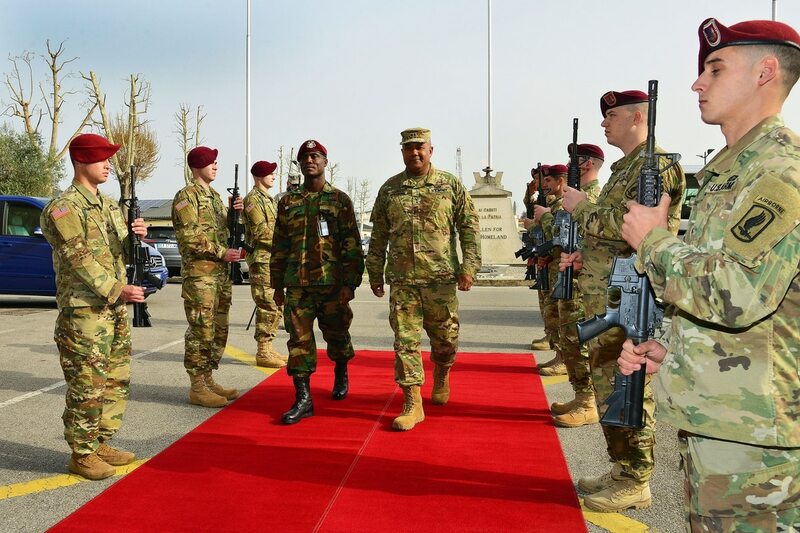 Williams relinquished command to Maj. Gen. Joseph Harrington on June 1 during a ceremony in Vicenza, Italy, where U.S. Army Africa has its headquarters. During his two-year tour there, Williams displayed "superb leadership, dedication and commitment," said Gen. David Rodriquez, commanding general of U.S. Africa Command. Rodriguez presided over the ceremony. Williams, who recently was confirmed by the Senate for a third star, is moving on to lead NATO's Allied Land Command in Izmir, Turkey. 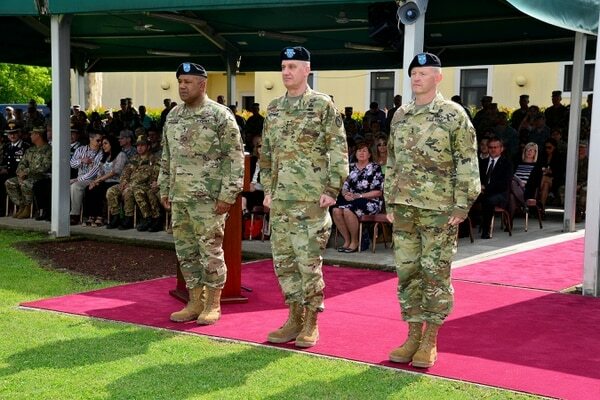 (From left) Maj. Gen. Darryl A. Williams, Gen. David M. Rodriguez, commander, U.S. Africa Command, and Maj. Gen. Joseph P. Harrington take part in the U.S. Army Africa change of command ceremony. From left to right, Maj. Gen. Darryl Williams, Gen. David Rodriguez, commander of U.S. Africa Command, and Maj. Gen. Joseph Harrington take part in the U.S. Army Africa change of command ceremony. He spoke to Army Times before leaving Africa Command to discuss the progress that's been made and the challenges that persist. What are some of the threats facing Africa today? With 54 countries and more than 2,000 languages, U.S. Army Africa has a large area of operations, Williams said. But the most pressing threats include al-Shabaab, a Somali-based militant group with ties to al-Qaeda, in East Africa; Islamic extremist group Boko Haram in Central and Western Africa; and other violent extremist organizations, including the Islamic State terror group, which has become an emerging threat in the north, Williams said. America's African partners are also growing concerned "about these threats migrating across the continent," Williams said. "I just think the trans-national threats in Africa will continue, and they're not going to be contained in just one region," he said. What are some highlights from your tenure as commanding general? More than 36 army chiefs, including U.S. Army Chief of Staff Gen. Mark Milley, gathered in Tanzania in May for the African Land Forces Summit in Tanzania, Williams said. The leaders talked about "everything from regional issues such as poaching and border issues, counter-IED, trans-national threats, to issues that are across the continent, like violent extremist organizations," he said. "It was very, very valuable for the U.S. Army chief to talk to, to partner with, to figure out opportunities to work together in the future," Williams said. In late 2014, Williams led the first group of soldiers sent to Liberia to help the U.S. Agency for International Development and government of Liberia fight the spread of the Ebola virus. Williams and his team stayed in place until soldiers from the 101st Airborne Division could be deployed to support Operation United Assistance. The work the U.S. military did in support of USAID "really made a big difference, I think," Williams said. "And we continue to have a partnership with the Liberian government." During his command, Williams also worked to grow the Accord series of exercises, which take place across the different regions in Africa. The exercises, which range from command post exercises to full-blown field training exercises, are a "very, very powerful forum," Williams said. He also has boosted medical exercises designed to give Army doctors and nurses the chance to practice in austere environments. There are five medical readiness exercises scheduled this year, including in Senegal, Ghana, Chad, Gabon and Uganda, Williams said. All of these exercises are tied in with African Horizons, a new program stood up by Williams to synchronize U.S. Army Africa's training and partnership efforts across the continent. African Horizons is how the Army "knits" the regions of the vast African continent together, Williams said, and it encompasses everything from small military-to-military engagements to the large Accord exercises. Sgt. Tyesha Smith (right), a military policeman with the 93rd Military Police Battalion, explains a tactical movement procedure to members of the Zambian Defense Force during an exercise at Southern Accord 2015 in Lusaka, Zambia. The annual exercise is one of the ways the U.S. military builds partnerships with its African counterparts. What other advances or changes have come about during your tenure? Under the leadership of AFRICOM, the military now has cooperative security locations so it can more quickly respond to contingencies on the continent, Williams said. These locations, which are austere, low-maintenance sites, sometimes just an open but secured field, were set up after the 2012 attack on the American diplomatic compound in Benghazi, Libya. "We have very austere, lean, lily pads, if you will, all over Africa now," Williams said. Of those, the Army is the caretaker for four – in Senegal, Ghana, Gabon and Uganda. It soon will also be responsible for a fifth site, slated to be stood up soon in Botswana. These sites typically don't hold U.S. troops and are sometimes used during training exercises, Williams said. But if needed or if there's a likelihood of a potential challenge, the sites allow the U.S. military to stage up to 300 soldiers or Marines for a short-period of time, he said. "We can stage [them] so they can surge to an event," he said. "They enable readiness on the continent, they're in a position where we can respond better on the continent are able to react quicker." The cooperative security locations are part of "increasing our presence in Africa," Williams said. "We'll go in an exercise there, use the facilities, make sure they're up to speed in case we need them," he said. "It was AFRICOM's response to increasing our posture and the responsiveness of the U.S. military on the continent of Africa." 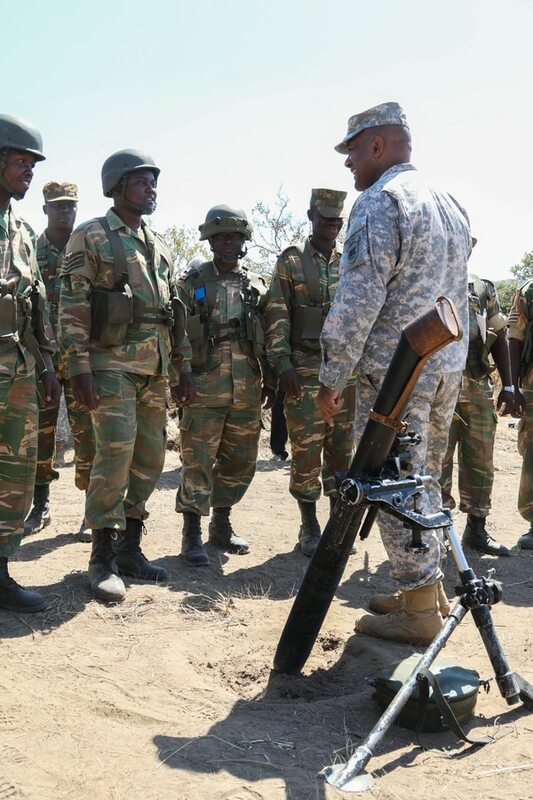 Maj. Gen. Darryl Williams, U.S. Army Africa commander, speaks to a Zambian mortar team during Exercise Southern Accord 2015 in Lusaka, Zambia. What do U.S. troops gain from being in Africa? "We have 7,000 to 8,000 U.S. Army soldiers who now are familiar with, who've trained on the continent, who understand what it's like to train in very hot conditions, very austere conditions," Williams said. "The readiness of the U.S. Army soldiers and our tactics, techniques and procedures have increased as we continue to partner with our African partners." At any given time, there are about 2,000 soldiers working and training across Africa, Williams said, adding that U.S. Army Africa relies on regionally aligned forces from the U.S. who rotate in and out to support missions on the continent. Soldiers from 2nd Brigade Combat Team, 3rd Infantry Division currently make up the core of the regionally aligned forces for Africa. A brigade from the 101st Airborne Division will take over later this summer, Williams said. The command also has logistics and sustainment units, along with other enablers. "The Army has been very, very generous in getting us what we need," Williams said. The partnerships also benefit U.S. troops, he said. "U.S. Army forces learn as much from our African partners as they do," Williams said. "When we have these exercises, when we have these military-to-military [engagements], we learn as much." U.S. Army Africa also recently added its own military intelligence brigade, which Williams called "a big plus." "These intel soldiers are partnering with African soldiers and building their intel capabilities," he said. What's your take on the way ahead? "I'm very optimistic about Africa, about their armies," Williams said. "Are there challenges? Yes, there are challenges in all armies." Two biggest challenges faces the forces are logistics and intelligence, he said. "They struggle with maintaining forces in the field," Williams said. "They can field a force, but how do you sustain it and maintain it over great, great distances?"